← Are You Really A Team Player? I imagine this is something that rates very high on the frustration scale in a lot of organizations because hierarchy is so often allowed to get in the way of good ideas. And, while there are many people and organizations working hard at creating more collaborative working environments, I suspect there are just as many digging in their heels and clinging to their pedestals with the tenacity of a dog with a bone. So, if you are a leader positioned somewhere in the middle of the organizational pack or an individual who wants to make a tangible difference in your organization, how do you do it? Well first, making change happen in any organization is about influence, not control. Even if you are the Chief Cook and Bottle Washer of your organization, making a success of change almost always means convincing others that it is a good idea. But where to start? Well initially, I think that it helps to have an understanding of the emotional nature of change. When we are faced with change, be it presented in an orderly way or unceremoniously thrust upon us, there is a typical pattern of emotional responses that we all experience as we move from a past state to a future one. There are a number of models available that explain these, but this one, produced by Rapidbi is for me, the simplest and most self explanatory. To learn more about how this works, click here for a good synopsis written by iBiz Resources . 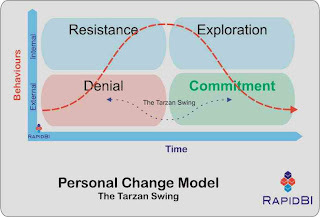 The basic message though is that no matter who we are, or how flexible we consider ourselves, when faced with change, we all move through this transitional curve, beginning with denial; through resistance; exploration and; then finally commitment . It is of course preferable to be able to move from denial to commitment as quickly as possible because frankly, hanging around in resistance,(which is usually accompanied by anger and depression), is a bit of a bummer. So, you might be thinking, How does all this help me to get my ideas across and influence change in my organization? Well, knowing that your boss, (or bosses), go through this process, just like everyone else, helps. And, when proposing a change, one of your goals can be to help those you need to influence make a quick emotional transition. You will, of course have to do your homework. Otherwise you may find yourself being hit by a barrage of reasons why the change you suggest can’t possibly be done. What is driving the change I am proposing? How will the future be different because of it? What specific positive outcomes do I expect from it? What objections or resistance might there be to this change? Why? How might I address them? Change is a huge topic. People make lots of money talking about it, writing about it and guiding others through it. There is no simple formula that can be covered in one posting. But this just might be a beginning. I like this post a lot. Especially in the IT realm, we are all agents of change. We can all make things happen in our sphere of influence, even when we aren’t the top dog. And it’s important to remember that no one is the top dog; everyone has a boss. As with many things, placing yourself in the shoes of the “changee” will make your job as the “changer” easier. Empathy and consideration go a long way to making change easier. The phrase “first seek to understand” comes to mind when I read your comments. And that advice is worth its weight in gold. Enjoyed your post, Gwyn. Some of my favorite readings on the topics you touched upon are “Leading Up” by Michael Useem and “Leading Change” by John Kotter. Cheers! I am a big fan of using images to make content stick. I love your choice of a change agent painting his colleagues. Nicely done. Change is a fascinating leadership topic. A lot has been written; but influencing change is easier said than done. Your use of the “personal change model” is very enlightening, and helpful in understanding the dynamics of change. 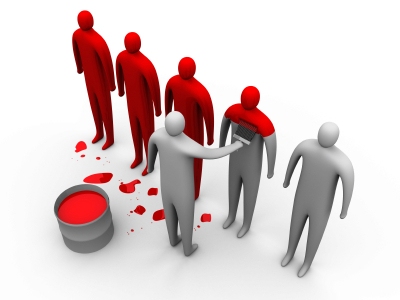 How important is it to identify other people within your organization who influence others, and seek out their support? How would you recommend approaching these people? Can you influence change within an organization by approaching the “boss” directly, without the support of other colleagues? I enjoyed reading John Maxwell’s, “The 360 Degree Leader”, and Michael Watkins, “Shaping the Game”. You hit on a very important aspect of making change happen and that is gaining support from other stakeholders… an absolutely essential part of the process. I’m going to write more posts about change to include this and to touch on the importance of building personal credibility too. Thanks so much for your thoughtful and insightful comments and for the book recommendations! Pingback: You’re Not the Boss of Me - Change when you are not in charge! « Wisewolf Talking - resources for those managing or going through change!